develop and implement a holistic cybersecurity strategy aligned with their unique needs and goals. It provides a set of industry standards and best practices aimed at cost effectively managing cybersecurity risks. 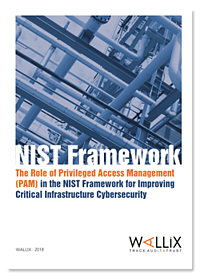 Privileged Access Management (PAM), which controls administrative access to critical systems, figures prominently into the adaptive, customized process of Framework implementation. This paper looks at the role of PAM in turning the concepts of the Framework into a practical reality. Find out how to respond to the most complex aspects of the NIST Cybersecurity Framework in this white paper!